About 2,000 miles from the nearest continent, and 1,400 miles from the next closest inhabited isle, lies a tiny chunk of land only 65 square miles in size. It is the most isolated, inhabited place in the world, Easter Island. When the explorer Jacob Roggeveen found it on April 5, 1722 (Easter day, henceforth the name), the natives, numbering about 2,000, had no idea that other peoples, beside themselves, existed. This is not surprising since the islanders had no boats or canoes capable of crossing the sea. Roggeveen, in his log, described the few craft they had as "bad and frail." What Roggevenn did find surprising was the presence of 200 haunting stone statues that lined the coast. Some were as high as 33 feet and weighed 82 tons. Abandoned in quarries or along roads were another 700 statues, some 65 feet tall and weighing 270 tons. Roggevenn observed that Easter was a barren island with no timber for scaffolding or plants for making heavy ropes. How could such massive monuments be carved and erected by such a small group of people lacking basic materials? Many people have pondered the mystery of Easter Island. Erich von Daniken, the Swiss writer, insisted that extraterrestrials had constructed the statues (he also suggested that ancient alien visitors were responsible for the Egyptian pyramids, Nazca lines, etc.). Now archaeologists exploring Easter have pieced together a history that is almost as strange as an alien encounter and perhaps more frightening. Archaeologists have done this by taking a "core" of the ground under a swamp or pond and looking at the pollen grains found there. Grains are dated by a method known as radiocarbon dating, and the number of grains found indicate how numerous the plant was at that particular time in history. Archaeologists have also examined trash pits left by humans to understand what they were up to during different periods of Easter Island history. 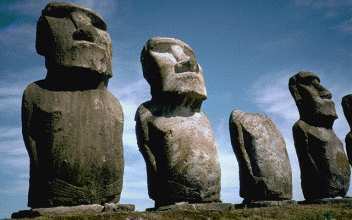 When the first Polynesians landed on Easter Island, around 400 to 700 A.D., what they found was far from a barren land. The Island was a sub-tropical paradise. Thick forests of palm trees covered the hills. Other plants including the hauhau tree, which can be used to make ropes, were also numerous. Seabirds, including the albatross, and boobies, as well as others, used the Island as a nesting place. Porpoises played in the waves. Archaeologists examining bones found in the trash pits discovered that the main meat diet of these early islanders consisted of the porpoise, which had to be caught well off-shore from heavy canoes, and the seabirds. With conditions so fine on Easter the human population quickly swelled. Estimates of population range up to 20,000 at its peak. The islanders soon had enough time left over after mere survival to start building the huge statues that cover the island. These were probably erected by rival clans each one wanting to have the largest and most numerous statues as a sign of status and wealth. The island must have been well organized because the resources to build the statues were widely scattered. The best stone for the statues came from one quarry. The rock for the statues'crowns from another, and the tools to work the stone yet from another place on the island. Trade was well developed. The Islanders started chopping down the palm trees to make rollers and sledges to move the statues. They cut the hauhau trees to make the ropes needed to pull and erect the monuments. By 1400 the palms were well on their way to becoming extinct, and only a few of the hauhau trees survived. When the last palm was cut down there was no longer the wood to make the heavy canoes needed for long sea voyages or to hunt the porpoises that were an important part of the Islanders diet. With the porpoises gone the people had to turn even more to the seabirds, and then the rats, as a source of food. When they were gone, starvation resulted, the government collapsed and cannibalism appeared. Human bones started to find their way into trash pits. By the time Roggeveen arrived it was almost all over. There were no living animals on Easter except the humans and a few domesticated chickens. Nothing larger than insects. And over the barren landscape stood the cold, stone statues, the strange proof that a great civilization once must have occupied the island. What makes this story so frightening? It is a warning tale to all of us. It is quite possible to wreck a closed ecological system by overusing it's resources. It happened on Easter Island and it could happen to our own planet Earth. All photos on this page are courtesy of Noe Zamel. Copyright Noe Zamel.